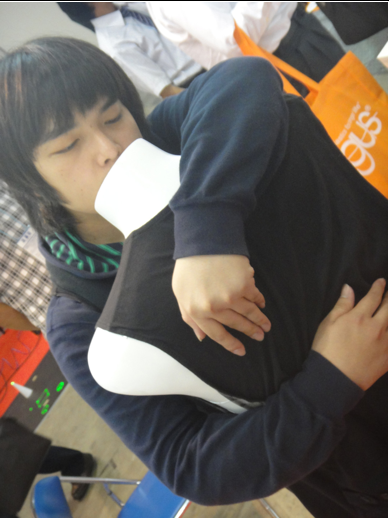 I am aware we have covered the Sense-Roid, a robotic device that lets you hug yourself (don’t ask), last week already. But now our friends over at Diginfonews in Tokyo went out and shot a professional video that shows the tactile communications apparatus in action and explains it in more detail (and in English). The Sense-Roid is essentially a mannequin wearing a jacket covered with tactile sensors, vibrating motors and a set of artificial “air” muscles – all to give you the sensation of hugging someone (or yourself). I am not really getting the concept, but the makers of the Sense-Roid say it could be used as part of a therapy. The Sense-Roid was developed by researchers from Japan’s University of Electro-Communications, the same institution that gave the world the online kiss transmission device last month.